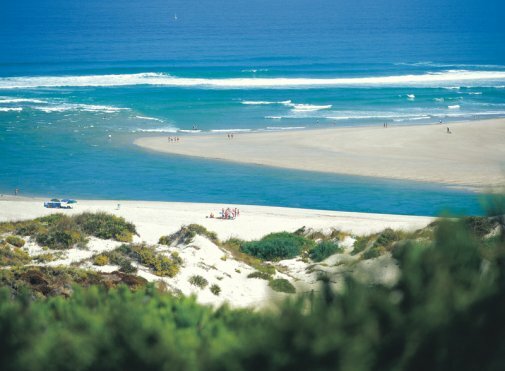 This tourist area probably enjoys the longest coastline of all six area in Portugal. Unfortunately, being more central and north of Lisbon the beach tourist season is not as lengthily as that enjoyed further south. The coastline, with very few exceptions consists of long sandy beaches that are openly exposed to the winter ravages of the Atlantic Ocean. There are three towns that do enjoy some protection and endeavour to maintain a fishing industry. 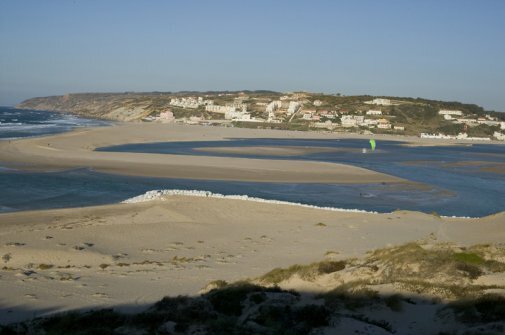 These are Aveiro, Figueira da Foz and Nazaré. Inland the economic situation changes to an agricultural landscape and a tourists haven with a wide choice of interesting and historic locations to visit. Moving south there are a number of interesting towns; Leiria, Alcobaça, Caldas da Rainha, all of which are attractive from a historic and their buildings. Leiria has an attractive restored castle whilst Alcobaça boasts of an impressive Monastery of Santa Maria founded in 1153 to celebrate a victory over the Moors in the Battle of Santarém. Fátima is a must location for any devout catholic and a new large impressive edifice of devotion has recently been opened. Two smaller locations are also worthy of mention, Batalha for its admirable and historic abbey which celebrates the Battle of Aljubarrota in 1385 built by the orders of Dom João I. This Monastery acts as the resting place for many past Kings and Queens of Portugal. There is the town of Tomar with an impressive castle which was also the home of the famous Order of the Knights of the Temple of Jerusalem. In 1160 its master, Dom Gualdim Pais order the impressive castle and temple to be constructed. The Order was eliminated in 1314 by the French King, Philip of France IV, but the power of this Order can still be appreciated by what remains and the magnificent "Chorola" which is in the heart of the Temple. Another location not to be missed is the walled small medieval town of Óbidos with its charming picturesque character. The town was once given by a King of Portugal in 1282 as a wedding present in order to gain favour with his new wife. The area economically is mainly reliant on small and medium size industries. However, not to be overlooked is the important agriculture industry and the production of wine. Local wood is the raw material supporting the production of furniture, building materials and paper pulp. In the region there is also non-metal ores such as clay, sand and limestone, all of which provide for by-product industries. The main city of this area is Coimbra, and its strategic midway point on the Lisbon to Porto road has played an important part in its past growth. Nowadays, there exists a direct motorway between these two major cities and combined with the possibility of a future new international airport this will have a definite reflection on the economic development of this area.